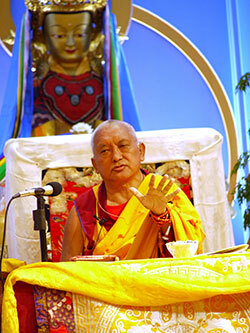 Lama Zopa Rinpoche during Lama Chöpa puja at Land of Medicine Buddha, USA, June 2012. Lama Zopa Rinpoche teaching at Maitripa College, USA, June 2012. Lama Zopa Rinpoche, with Khadro-la, visited FPMT International Office in Portland, Oregon, USA June 22-24 to bless various holy objects. 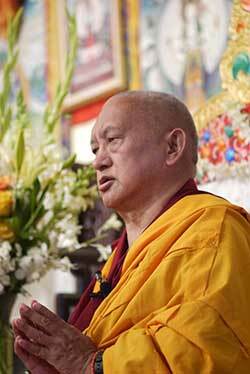 While in Portland, Rinpoche gave a teaching at Maitripa College which was webcast live. If you missed that opportunity, you can still watch the teachings online on the FPMT Online Learning Center. “Pilgrimage needs faith. The more faith, the more happiness. Otherwise, you are just like a tourist looking at ruins. Go to the Lama Yeshe Wisdom Archive for lots more advice from Lama Zopa Rinpoche. 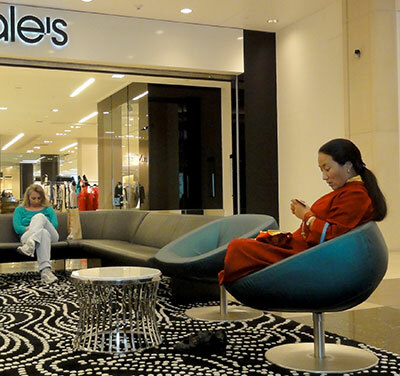 While in the USA, Khadro-la went to a big mall in San Francisco and recited the Diamond Cutter Sutra, June 2012. Photo by Ven Holly Ansett. We say farewell to both Sarah Pool, former Director of Finance and Ugyen Shola, former Administrator/Office Manager. Sarah and Ugyen started a new business in Portland, Oregon, USA in April 2012 called Pacific Northwest Kale Chips. Their new business has been so successful that both Sarah and Ugyen have decided to devote all of their time to their new venture. We thank Sarah and Ugyen for their years of service, and wish them every success in their kale chip business. Carl Jensen, a graduate of Maitripa College, joined International Office as Administrator/Office Manager in June, and is settling in very well. Aruna Kumari has accepted the position of Financial Controller and will commence working in International Office on July 23. Aruna holds a BA in Accounting and a Diploma in Business Administration. She has more than 20 years of experience in her field. We are very pleased to welcome Carl and Aruna to the International Office team. Chantable tunes for the Vajrayogini long sadhana prayers are now available as MP3 downloads in English and Tibetan. An MP3 download of Yangsi Rinpoche chanting the Heart Sutra is now available for free! The longest Chenrezig mantra (Compassionate Buddha mantra) is now available as a PDF download, as well as other resources relating to Chenrezig mantra and practice. We are delighted to offer Lama Zopa Rinpoche’s Compassion is of the Utmost Need quotes in Mongolian! Ven. Tsering writing the Prajñaparamita. Photo by Ven. Katy Cole. The Prajñaparamita Sutra contains the highest teachings of the Buddha and is among the most precious texts available in the world today. Due to the power of this text, writing it out is a way to generate tremendous merit and receive blessings. The Prajnaparamita Project was set up to provide the material resources needed to support the efforts of those writing out this text. All are welcome to participate by offering to this project. Rejoice! In 2002, Ven. 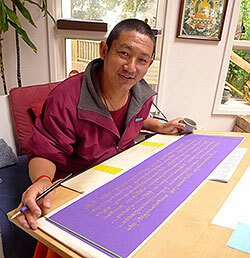 Tsering began writing out the 100,000 verses of the Prajñaparamita in pure gold. He has dedicated his life to this project since then, working steadily for the past nine years and intending to continue until completion. He finished the first volume in 2006, the second volume in 2011, and is now halfway through the fourth. Great heartfelt appreciation goes out to all those who have practiced generosity in 2011 and to the Merit Box coordinators who have worked so hard to make this beneficial project a success. The offerings distributed for 2011 from the Merit Box Project Fund amounted to US$60,000. We received 29 grant proposals totaling US$133,000 from various centers and projects and have awarded 19 grants this year. 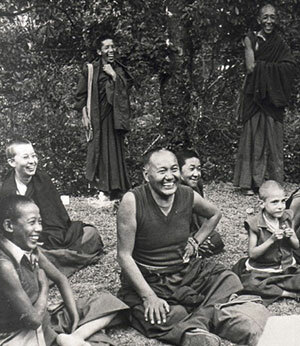 Lama Yeshe at a picnic in Kathmandu Valley with Ven. Karin Valham, Lama Lhundrup, Lama Pasang and Kopan monks, 1976. Photo courtesy of Ven. Karin Valham. Have you visited Mandala magazine online lately? We’ve posted over a dozen new exclusive online stories for the July-September 2012 issue of Mandala that you won’t find in print. Highlights include: “The Simile of a Cloud,” an excerpt from Khensur Jampa Techok Rinpoche’s new book Insight into Emptiness; a video of Universal Education for Compassion and Wisdom’s interview with Lama Zopa Rinpoche; Ven. Karin Valham’s “Road to Kopan” story; plus many more. If you would like to receive the print version of Mandala magazine – featuring original teachings, stories and photos from FPMT teachers and centers around the world – please consider signing up to the Friends of FPMT program. A new Discovering Buddhism (DB) information page has been added to the FPMT website. Please review “What Centers Need to Know about Hosting the DB Program” to ensure that your center is offering the program in its entirety, thereby providing students with the option to receive a completion certificate. Remember that completion certificates are one of the essential prerequisites for any student wishing to apply to become an FPMT registered teacher. The Foundation Store is offering FPMT centers, projects and services a 50% discount on the latest Lama Chöpa Jorchö Practice Book and Lama Chöpa Tunes and Audio Guide MP3. Make sure both items appear in your shopping cart to access this promotion. 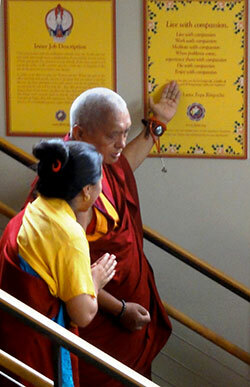 Lama Zopa Rinpoche shows Khadro-la the posters from the FPMT Display Pack in International Office, June 2012. “I was just looking for something in the FPMT Handbook and saw again that there is so much advice in there. I suggest to center administrators that they read a little bit of this each time they have a board meeting or management meeting. 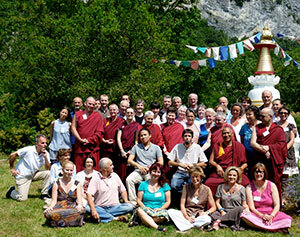 European Regional Meeting participants, Arco/Lago di Garda, Italy, 2012. Photo by Annette van Citters. Annelies van der Heijden, European Regional Coordinator, thanks Kushi Ling Retreat Centre, the hosts of the recent European regional meeting, and all who participated in a fruitful event, including Osel Hita who gave a much-appreciated talk, together with Gomo Tulku. “We had an amazing festival. We were humbled by the outpouring of the community. We are able to estimate by the number of plates that we used to serve lunch that somewhere between 600-700 people attended! We made the headline on the cover of our local secular newspaper! I again looked very closely at the advice Rinpoche gave us in 2008, when Rinpoche attended. We are happy to say that many of Rinpoche’s wishes have been realized, and we see again and again the good fruit of working diligently to achieve Rinpoche’s wishes. Vajrapani Institute, USA has opportunities for a kitchen manager, a housekeeping manager, a full- or part-time caretaker and a workstudy volunteer caretaker. Root Institute, India is looking for a nurse.